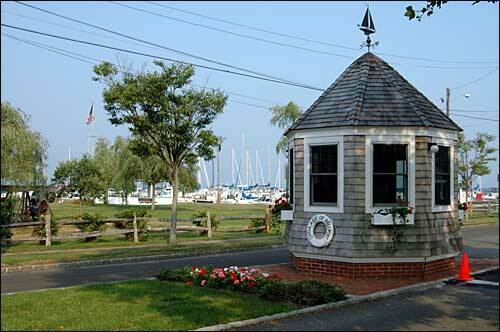 Known as "The Dock" to Village residents, the Bellport Village Marina offers year round activities for both children and adults. Encompassed by lush, park-like grounds, there is also a launching ramp for boats, an expansive area for fishing and crabbing, a spacious gazebo, a beach-front playground, and a bandshell where the tremendously popular, village-sponsored, summer concerts are held. In addition to affording a spectacular view of the Great South Bay, the Marina boasts over 150 berths, some of which are available for daily rental to transient boaters, including the specially-designated one for our village-owned ferry, the Whalehouse Point. In order to drive into the Marina area, your automobile must have a current Marina Permit sticker. Marina Permits are available only to residents and are free of charge. In order to receive a Marina Permit, you need a valid Resident I.D. Card issued at Village Hall. If you dispose of a vehicle that has a Marina Permit sticker on it, please remove the sticker and destroy it prior to the vehicle's disposal.